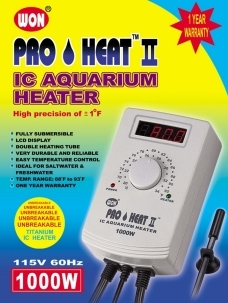 Pro-Heat II 1000 watt Heavy Duty heater can be used in a home aquarium or for commercial purposes. The Heater set consists of two parts: temperature controller and heating tube. The temperature controller can be separated and positioned in an area where temperature control is needed for non-thermostatically controlled heating devices by setting the temperature control dial to the desired temperature. For example: metal halide lighting system reef tank, heat emitter for reptile and incandescent heat bulbs for birds and reptiles. The titanium heater is for main glass aquarium tank use only. Do not use the titanium heating tube in an acrylic sump tank (wet / dry trickle filter tank) of designed module tank. 1. Heating tube can be positioned in either a vertical or horizontal position in the water. 2. Temperature controller can be used to adjust water temperature of reef tanks. Ensure that any metal Halide lamp is positioned at least one foot (30 cm) above the tank surface. Metal Halide lighting position is very crucial during summer months because the lamp will continually heat water even after the heater has automatically shutoff after reaching set water temperature. The Metal Halide lamp continually contributes to the heating process through its fluorescent lighting. It is advisable to adjust light output with a dial or digital temperature control unit. 1. Place the heater tube unit in water in either vertical or horizontal position. Press two suction cups firmly to glass to adhere heater unit to aquarium. For best results, position the heater towards the bottom of the aquarium in a location that water circulates freely or use a power head (pump) to create the water circulation to ensure uniform heating temperature of water. 2. Set the desired temperature by turning the temperature dial. Wait five minutes until the heater tube is acclimatized to the aquarium water temperature. 3. 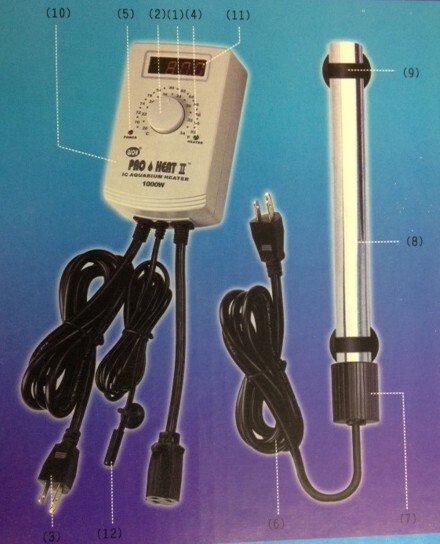 If the temperature sensor unit separate from heater unit, adhere the temperature sensor unit by firmly pressing the suction cups to the aquarium. 4. Plug the power cord of the heater into the outlet. The LCD display indicates whether the heater is ON/OFF (red light) and IN USE / NOT IN USE (green light). If the RED light is displayed, the heating unit is ON. If the RED light is not displayed, the heating unit has no source of electricity. If the GREEN light is displayed, the heater is working to maintain set aquarium temperature. If the GREEN light is NOT displayed, the heater has automatically shutoff after reaching set water temperature. 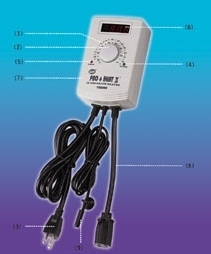 Controller unit provides a digital temperature LCD display that indicates the temperature of aquarium water. Operating temperature range is between 68°F and 93°F. The LCD display controller unit will maintain ± 1.5°F accuracy rating. 5. After a few hours, check the water temperature with an accurate thermometer, if needed, adjust the temperature setting on the heating unit to achieve desired aquarium water temperature. For proper operation, the heater tube should be positioned in a vertical or horizontal position in the water at all times. Do not operated the heater if the cord or heating tube is damaged in any way. The heater must be discarded. Do not attempt to repair the unit. Unplug the heater during water change or when removing the unit from water for maintenance. Wait at least 10 minutes for the heater to cool before removing from water. Make sure that your electrical voltage is the same as the voltage listed on the label of the heater. Water temperature will be show with Fahrenheit degree. *** If you want to change to Celsius degree display, please contact us.